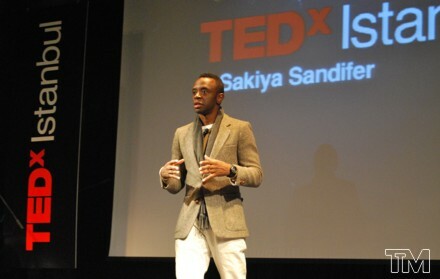 The Think Movement by J. Sakiya Sandifer » what an experience!!! The overall experience was truly a “Thank You And You’re Welcome” moment for me. From me learning who and how the invite was extended to me by my new friend and fellow thinker Ali Isitir, to being able to exchange ideas with other thinkers from around the world, to being able to listen to the story of what motivates Serdar Erener (one of the most successful men in advertising in Istanbul), to his son Ali drawing a caricature of me at dinner in exchange for a “Thank You And You’re Welcome” book. The only downside of the trip was that I didn’t take enough mental pictures while on stage. It seemed like I was only up there for 5 minutes. Being super critical of myself, I gave myself a C+ at best mainly because I actually lost my train of thought while on stage!!! Imagine my surprise afterwards of not only hearing some of the fellow presenters quoting me in conversations, but when an attendee told me how he was really impressed with the honesty of admitting to the mental lapse in the moment. Not saying that losing my train of thought is something that I wish to ever repeat on stage again, it’s a perfect example of how two people can look at the same thing and see something totally different. For me, I saw that although I’m better than I’ve been, I’m no where near as good as I’m going to get! All in all, I highly recommend that everyone chase their dream simply because you just might catch it!!! Congrats. Sakiya on doing a TED. Will you be posting a video? Very very good and motivating!